The Jumbulance Trust exists to make accessible travel possible for adults and children who are disabled or have a serious or complex health condition. We offer groups and individuals the opportunity to take holidays, short breaks or a day out in the UK or Europe by providing special part coach / part ambulances called Jumbulances. Together with a team of experienced drivers, our affiliated groups of professional, medical and lay volunteers, we make dreams come true! We make our medically equipped, accessible Jumbulances available to affiliated groups, care homes, hospices, special needs schools, disability sports groups, families diocesan groups and others. UK holidays include the highlands of Scotland, Lake District, Norfolk, Blackpool, Wales and more. Day trips to the seaside, safari parks, city sightseeing, shopping trips etc. Want to travel with us? Check out our destinations page for inspiration and get in touch! 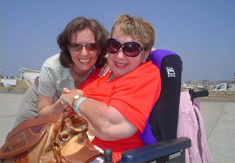 As an accessible travel charity, we bring joy to many of our passengers by providing transport for their voyage and making many memories along the way. Got a group trip to an event this year and are unsure of how you will get there? Our friendly team will be more than happy to help. In the mood to hold a cake sale or run a marathon for the Jumbulance Trust? You can find out more about fundraising on our support page.